I finished this blanket just in time for the beach yesterday. It’s made from two Ikea towels that I picked up last summer. I think the towels cost about $7 each and that is really something because their quality is outstanding. Actually, a little too good for a pool or beach towel – too large and heavy. 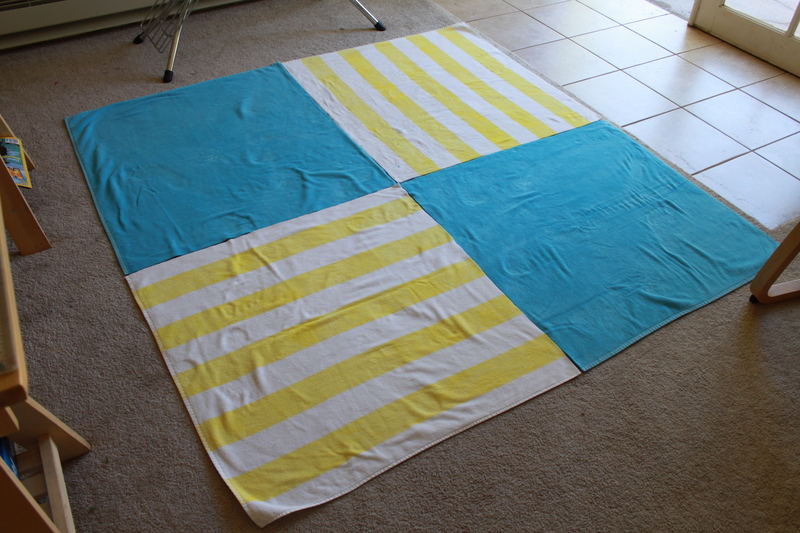 So I decided to go with that theme and make them even larger and heavier by combining the two towels into one beach blanket. I think I’ve got a seam finish that will both keep the seam allowance flat and prevent raveling. Hope so anyway. I made this one about a million years ago. The squares are actually inexpensive napkins that I bought at Cost Plus. This didn’t save me any time or money, mind you. The napkins’ edges needed to be cut off and then they needed to be made square and the napkins really weren’t that inexpensive, but I was charmed by the project in a magazine from the 90s that I really loved called Handcraft Illustrated. And I guess I really just like making blankets. p.s. 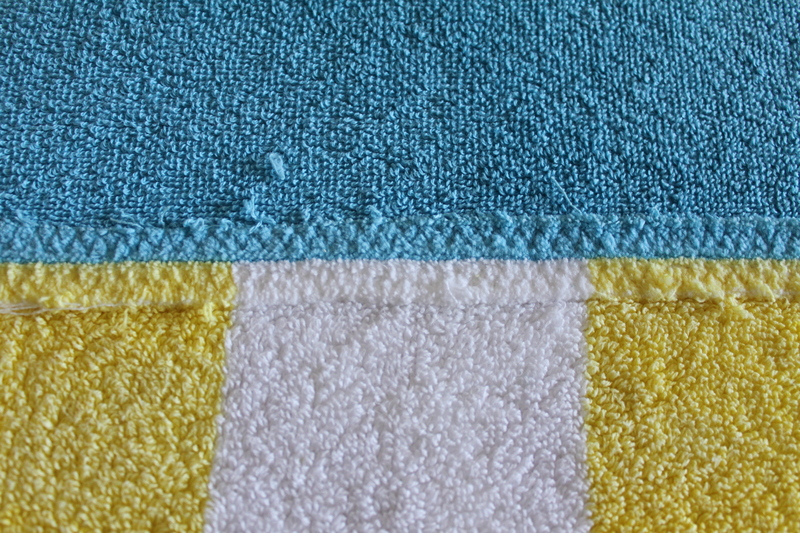 If you’d like to learn how to make a strap for your blanket, please click here. Is that photo of the Capitola wharf? Good eye – yes it is. like the blanket, I am a quilter. You might be one too! Thank you. I wouldn’t call myself a quilter though I certainly use quilting techniques now and then. I’ve only got one post about quilts really. If you’re curious you can see it here. Thanks for writing and happy quilting! Thank you so much. The bag is awesome, isn’t it? I’m so glad you asked and happy to tell you that I got it at Whole Foods (of all places!) – last year though. I know it was woven in Africa, not sure if I saved any more info to help you locate it or something similar. I’ll take a look though – I’m kind of obsessive that way! I loved the beach towel blanket so much i made one my self but i sewed a vinly table cloth on the back and no sand comes though love it! thank you so much for the idea oh and you can turn it over and use the other side for picnics!!!!!! That’s a brilliant idea – might have to try that myself next time. Enjoy your blanket! Thanks very much from Colleen at My Material Life. wow! It’s amazing! This idea definitily goes to my “must do” list! Well thank you – have fun and hope you enjoy yours! Thanks and good luck with it! Great idea! 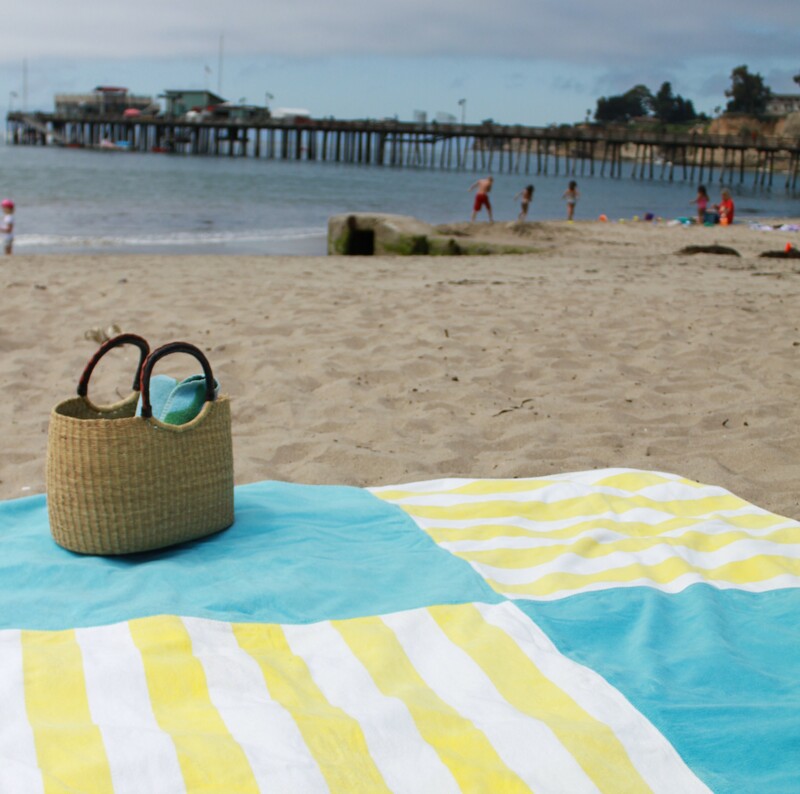 I love using a blanket for the beach instead of a small towel – this is perfect! You must be on the opposite hemisphere from me – enjoy your summer and thanks for writing! Great idea. I’ve been looking for over sized beach towels to use as a beach blanket, but this is even better. I can make it HUGE. 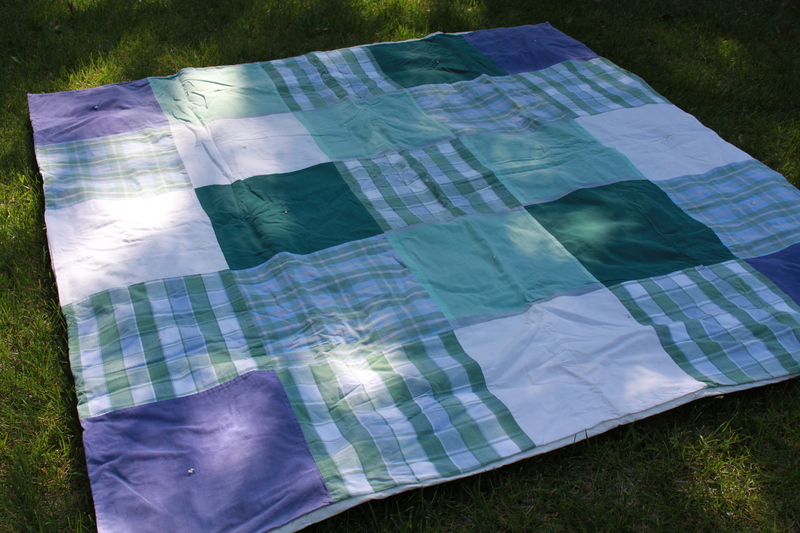 One question: How did you finish off the raw edges around the outside of the blanket? Great pictures of how you did the seems, but I can’t make out the edges (think binding on a quilt.) I love the idea of using napkins as well. For a really quick blanket to use at the beach, use an old sheet.. The sand just rolls off when you shake it! I knew it was Capitola too. Beautiful! I love this idea! You mentioned that you put a vynil table clothe on back to keep the sand out. How did you attach it to the towels? Hi Jen – I’m glad you asked about that. That’s a comment that was added to my photo by a Pinterest user. My blanket has no vinyl backing and I wouldn’t suggest adding one because my thinking is 1) it would make the blanket way too heavy and 2) it won’t keep sand off the blanket. But if it’s worked for anyone else, more power to them. I do think it’s a great idea for a lighter-weight blanket that may be used on damp grass. 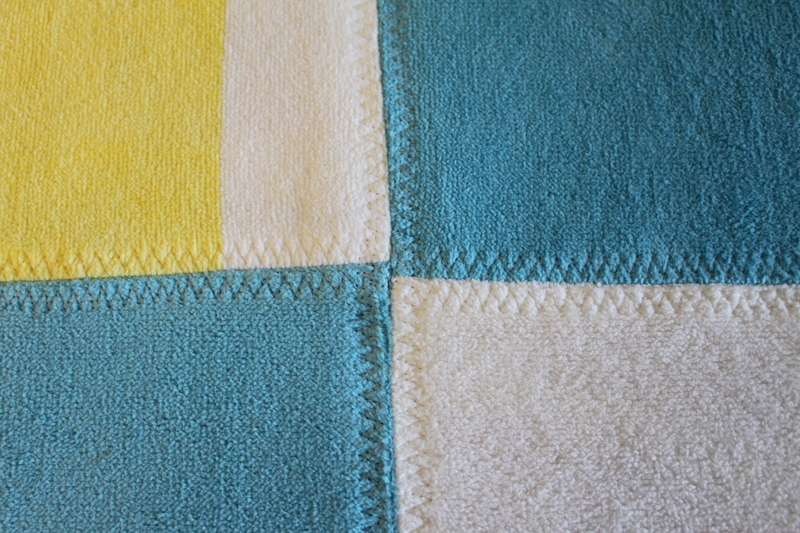 If you want to line your blanket, I’d suggest cutting your lining the same size as your blanket, placing both sides right sides together, stitching around the perimeter, and leaving an opening for turning right sides out again that you can machine or slip stitch together. Good luck! That looks like Capitola, CA, yes? I’m from SC :). Great idea! Thank you and good eye – you guessed correctly! Colleen, looking at Pinterest for ideas and came across this! Hope you all had a great Easter! Will call soon! Thank you – your blog looks very interesting. thanks, and you are welcome. Am fresh out of beach blankets, beach quilts this year. So, your idea caught my eye. Such a cleaver idea!! So funny I saw this on Pinterest and realized its the Capitola beach/wharf! I run by there all the time. Small world! Thanks and yes, it is a small world! Curious. With you having sewn this already… Would sewing a thinner type vinyl to the sand side work? Well people have commented about that, but I wouldn’t try it with this particular blanket because the toweling is very heavy already, and I wouldn’t want to make it heavier. Plus it wouldn’t help with the sand and I’d be concerned about it drying well. But you could always try it and see what happens! leave a hole in the middle, next time. for an umbrella. Glad you like it – thanks!